An exclusive, extreme school that offers the opportunity to go from zero to hero in two short weeks. Every single class will be offered during our intensive hands-on 10-day Polyurea University Bootcamp, allowing you to acquire all the knowledge needed to complete each of our comprehensive degree programs: Qualified Polyurea Applicator (QPA), Qualified Polyurea Professional (QPP), and Qualified Polyurea Inspector (QPI). 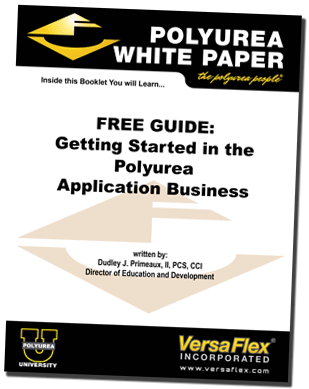 Initially designed for our global partners, we are opening the Polyurea University Bootcamp to all students, giving those who might find travel and scheduling difficult for our other specialized schools offered throughout the year the opportunity to attend every class in one two week period. Note: Please refer to the schedule above for actual class dates — course descriptions are below. (1 Day Instruction) – This is a unique class in that information is presented on the importance of a Specification and how to follow. This class can also help those in preparation of a specification, and what is required for successful application work. Reference information includes that from CSI: Construction Specification Institute, Construction Specification Institute Canada and European EFNARC. Information will also be presented on the various Industry Standards and Guidelines related to polyurea coating / lining application work. A Certificate of Completion will be provided to all attendees.